The Eccotemp L5 Portable Tankless Water Heater enables you to enjoy hot water wherever you go. This unit is capable of producing up to 1.4 gallons of hot water per minute. It comes complete with a shower nozzle with multiple settings, setting up a portable outdoor hot water shower has never been as easy or simple. This portable, tankless water heater comes complete with everything you need. Including the adapters needed to attach it to any garden hose nozzle and to any propane gas tank. The Eccotemp L5 uses battery ignition which means that as soon as you turn it on you have a readily available supply of hot water. 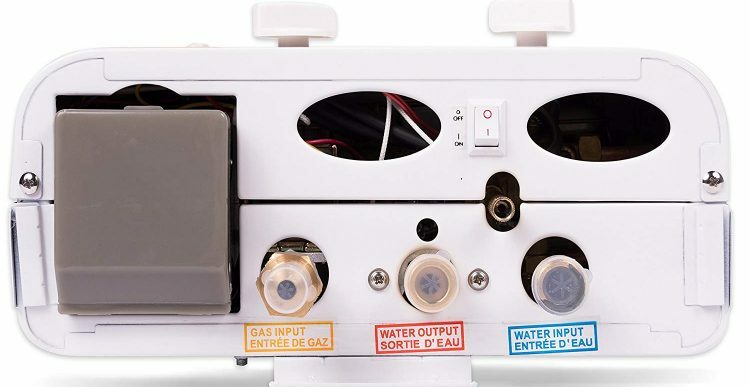 The battery ignition system makes this unit a good choice for any outside location, especially if the location you need hot water at is off the electricity grid. The Eccotemp L5 Portable Tankless Water Heater is a popular item amongst customers who have reviewed this product. From reading the customer reviews it is apparent that buyers are generally very happy with their purchase. Many customers appreciate the fact that the Eccotemp L5 comes complete with many items which are usually considered as optional extras by other manufacturers. They like the shower head, propane tank hook-up and the mounting hardware, all of which are included in the price as standard equipment. Some customers commented that the L5 was prone to the pilot sometimes going out in windy conditions. This was easily fixed by installing the unit in a sheltered location out of the wind and did not affect the overall functionality of the L5 at all. Overall, customers were pleased with how this gas tankless water heater performed. Some experienced problems which were water-pressure related. Generally though, this did not detract from the ability of the L5 to produce a satisfactory amount of hot water when required. The Eccotemp L5 Portable Tankless Water Heater received an overall average customer rating of 4.5 stars out of a possible 5 stars maximum score. This is quite encouraging. Out of the 53 customer reviews for the Eccotemp L5 that we found, 35 reviewers gave it the maximum rating of 5 stars out of 5. If you are looking for a portable water heater for your cabin, for camping, for off-grid use or as an emergency backup water heater, then according to the customer reviews which we have studied, you will probably find the Eccotemp L5 Portable Tankless Water Heater to be a good purchasing decision which you will not regret buying.